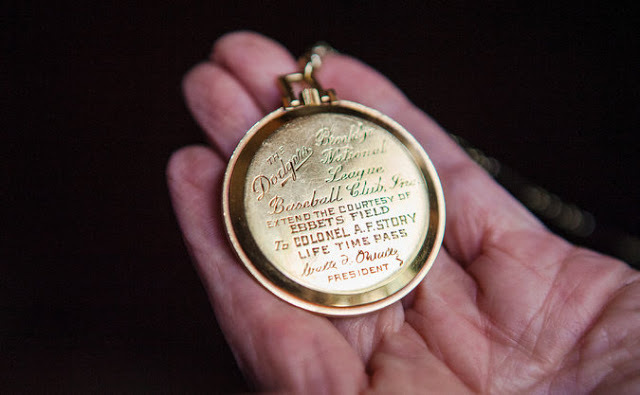 The New York Times tells the story of a gold LeCoultre pocket watch given to Lieutenant Colonel Anthony F. Story, the personal pilot of General Douglas MacArthur, that was also lifetime pass to Ebbets Field, once home to the Brooklyn Dodgers baseball team. In some ways the ancestor of today’s smartwatches that double up as keys to digital vaults and even physical locks, this Jaeger-LeCoultre pocket watch was once assured lifetime entry into the stadium home to the Brooklyn Dodgers, as detailed in The New York Times. Given Lieutenant Colonel Anthony F. Story by the team’s president, it’s a a lifetime pass to Ebbets Field, once the stadium of the Brooklyn Dodgers base ball team (which became the Los Angeles Dodgers after moving to California in 1957). The origins of the pocket watch are mysterious, with Jaeger-LeCoultre having no record of it. In a twist to the tale, Story said before his death MacArthur had an identical lifetime pass pocket watch, though no trace of that has been found. According to contemporary news reports MacArthur’s lifetime pass was gilded and shaped like a credit card. Story was pilot to General Douglas MacArthur during his time in postwar Japan and the Korean War, and later became president of the American operations of Jaeger-LeCoultre in 1955, lasting till late 1956. The New York Times has the full story.